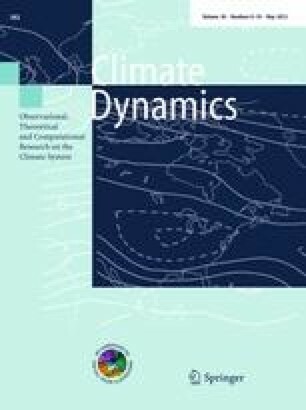 December–January–February (DJF) rainfall variability in southeastern South America (SESA) is studied in 18 coupled general circulation models from the WCRP/CMIP3 dataset, for present climate and the SRES-A1B climate change scenario. The analysis is made in terms of properties of the first leading pattern of rainfall variability in the region, characterized by a dipole-like structure with centers of action in the SESA and South Atlantic Convergence Zone (SACZ) regions. The study was performed to address two issues: how rainfall variability in SESA would change in a future climate and how much of that change explains the projected increasing trends in the summer mean rainfall in SESA identified in previous works. Positive (negative) dipole events were identified as those DJF seasons with above (below) normal rainfall in SESA and below (above) normal rainfall in the SACZ region. Results obtained from the multi-model ensemble confirm that future rainfall variability in SESA has a strong projection on the changes of seasonal dipole pattern activity, associated with an increase of the frequency of the positive phase. In addition, the frequency increase of positive dipole phase in the twenty first century seems to be associated with an increase of both frequency and intensity of positive SST anomalies in the equatorial Pacific, and with a Rossby wave train-like anomaly pattern linking that ocean basin to South America, which regionally induces favorable conditions for moisture transport convergence and rainfall increase in SESA. Comments and suggestions provided by two anonymous reviewers were very helpful in improving this paper. We acknowledge the international modeling groups for providing their data for analysis, the Program for Climate Model Diagnosis and Intercomparison (PCMDI) for collecting and archiving the model data, the JSC/CLIVAR Working Group on Coupled Modeling (WGCM) and their Coupled Model Intercomparison Project (CMIP) and Climate Simulation Panel for organizing the model data analysis activity, and the IPCC WG1 TSU for technical support. The IPCC Data Archive at Lawrence Livermore National Laboratory is supported by the Office of Science, U.S. Department of Energy. This research was supported by the European Commission’s Seventh Framework Programme (FP7/2007–2013) under Grant Agreement N° 212492 (CLARIS LPB. A Europe-South America Network for Climate Change Assessment and Impact Studies in La Plata Basin) and CONICET/PIP-5400. The first author C.J. is supported by a Ph.D grant from the Ecole Polytechnique.